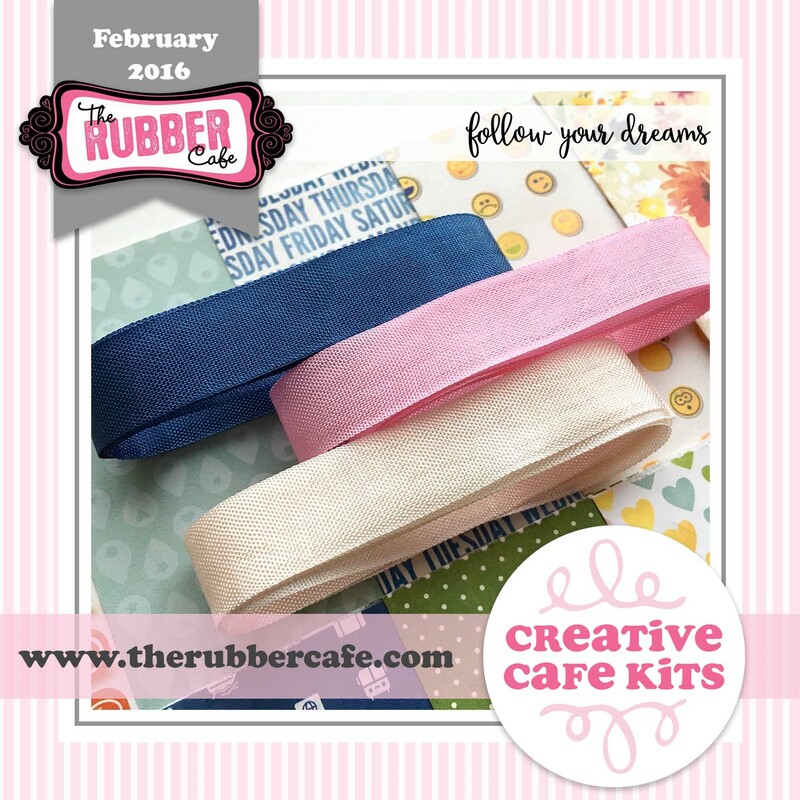 Hello TRC Fans! 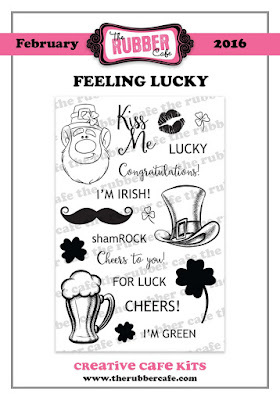 In our house, St. Patrick's Day is a real celebration! I decorate the kitchen table and make an american feast of Corned Beef and Cabbage. 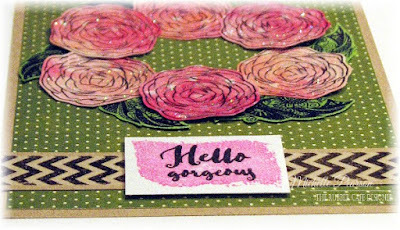 When I saw the Add-On stamp set - Feeling Lucky - I could almost picture this card in my mind! This card measures 4 1/4 x 5 1/2", which is an A2 size card. 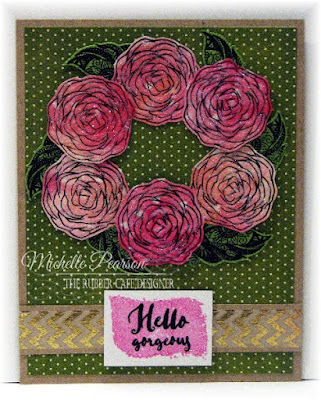 I cut the green dot patterned paper to 4 x 5 1/4" and glued it to the Kraft cardstock base. 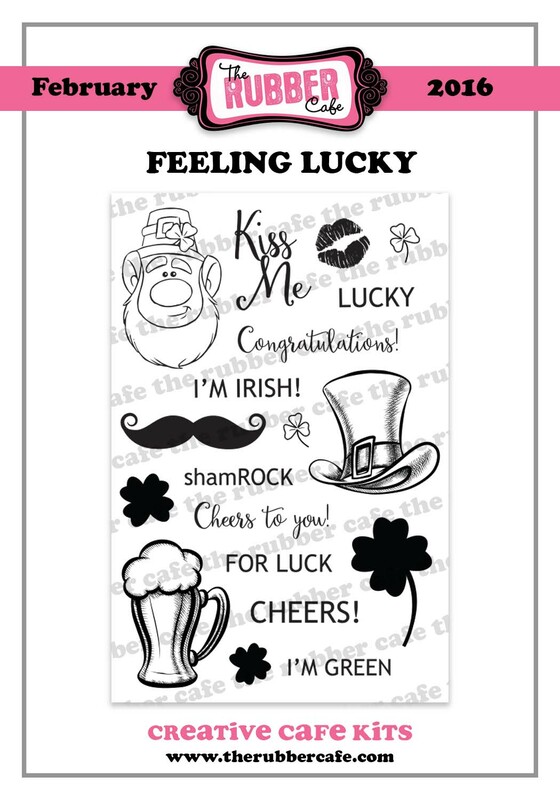 I stamped the shamrock using some green chalk ink onto white cardstock and then stamped the sentiment using Tuxedo Black Memento ink all over the strip of white cardstock. 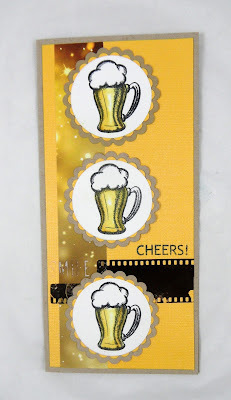 I punched out a circle from the Kraft cardstock and covered it with the gold foil washi tape included in the kit. I stamped the sentiment and the lips onto some white cardstock and used a smaller circle punch to punch it out. I layered the sentiment onto my washi covered circle. 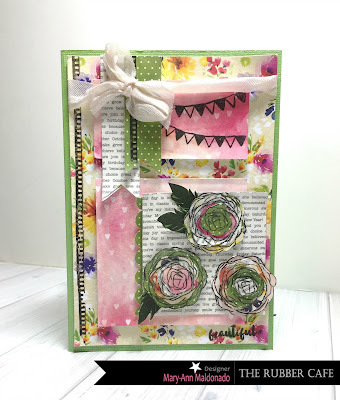 I added seam binding and then using some 3d foam squares, I adhered the sentiment circle into place to complete this card. Here is a close-up. This was fun to create! 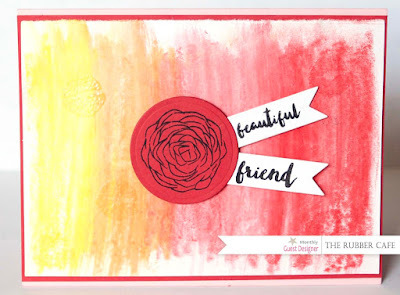 I am going to make a couple more of these cards to send to my 2 daughters that are away at college! I think that will love this card! First Layer: 4&1/2" by 4&1/4" piece of wood grain patterned paper. Glue about 3/4" from the left edge of the base card. 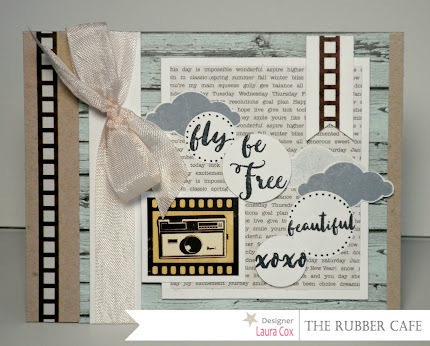 Apply film strip rub-on to the left side of card (HINT: leave the backing on the rub-on, trim off what you want, then remove backing, and apply the piece you need to the card and rub on). Next Layer: Cut a 4&1/4" by 3/4" piece of white cardstock. Glue a piece of seam binding around it, and add a bow. 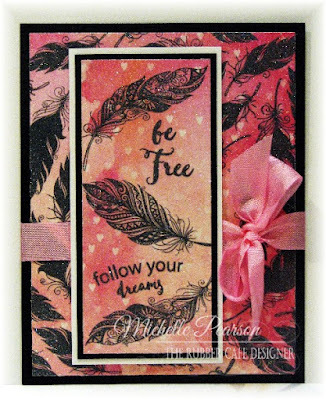 Glue to left side of wood grain patterned paper. 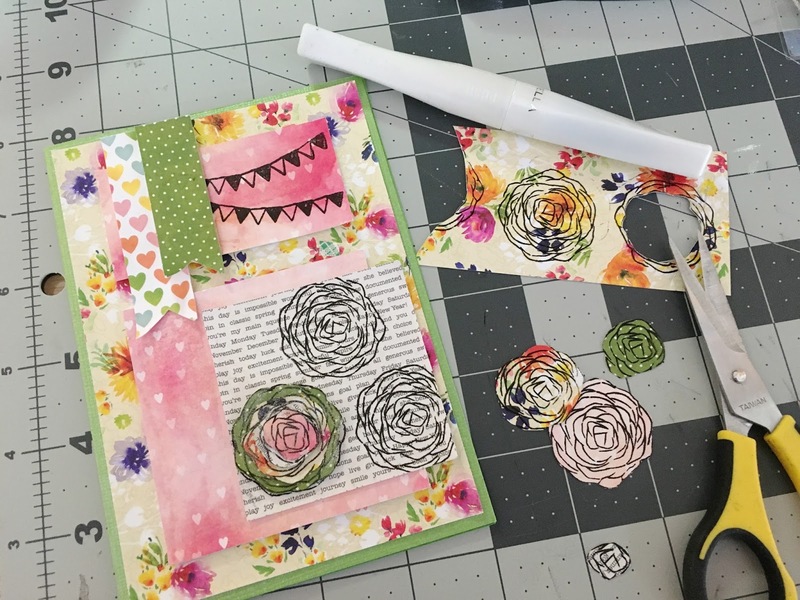 Center Panel: Cut a 2&3/4" by 3&1/4" piece of newsprint word paper, and mat on a 3" by 3&1/2" piece of white cardstock. Foam tape to card front. 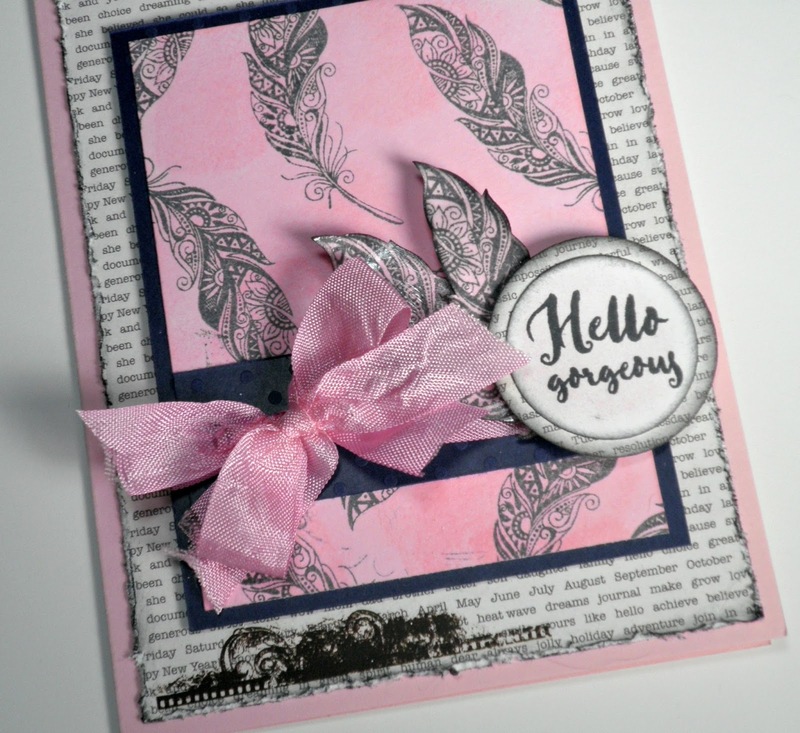 Stamp sentiments on white cardstock using Black Tuxedo Memento Ink, punch out circles (3/4" and 1"), add doodling to circles if desired. 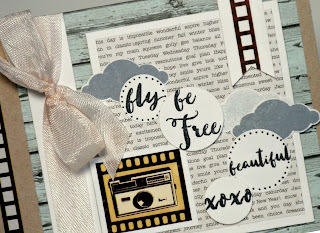 Stamp clouds using Weathered Wood Distress Ink, fussy cut out. 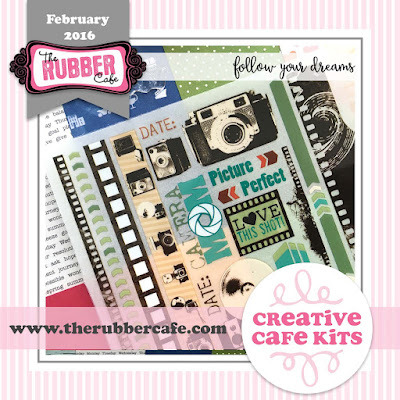 Use camera and film strip rub-ons on white cardstock and trim down (camera piece is approx. 1&1/2" by 1&1/4", banner is approx. 11/16" wide by 1&1/2" long). 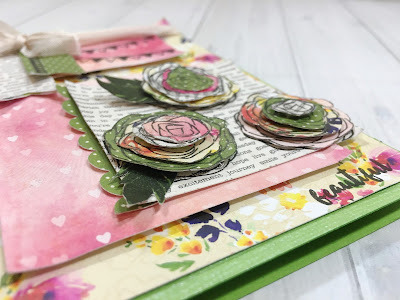 Glue all pieces to card front as shown using Scrap Happy Glue. 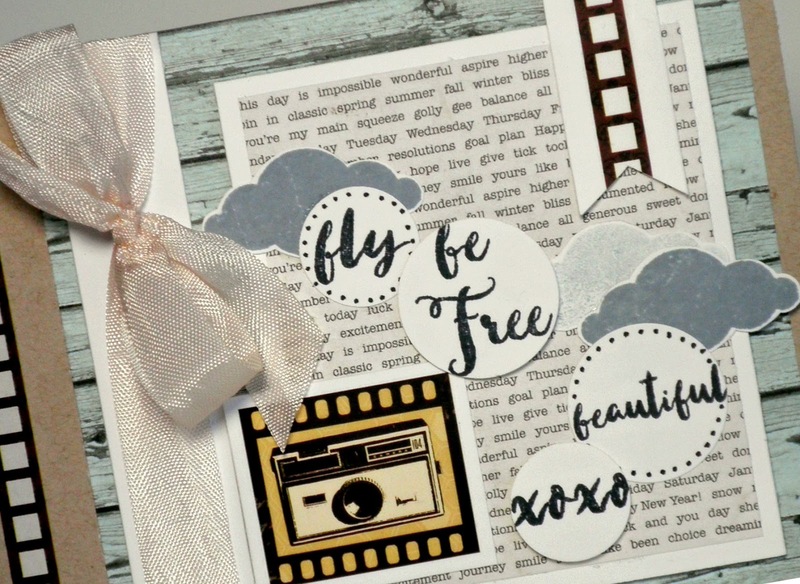 Foam tape "be free" and "xoxo" circles. 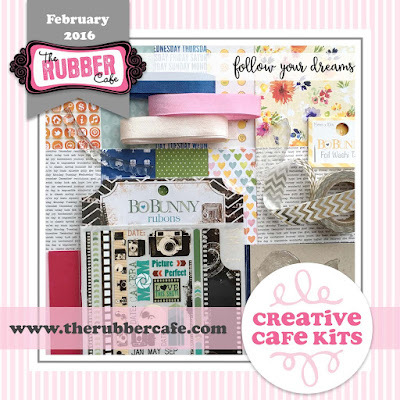 Thanks for stoppin' by today....hope you are enjoying this month's kit inspiration! Good Morning. 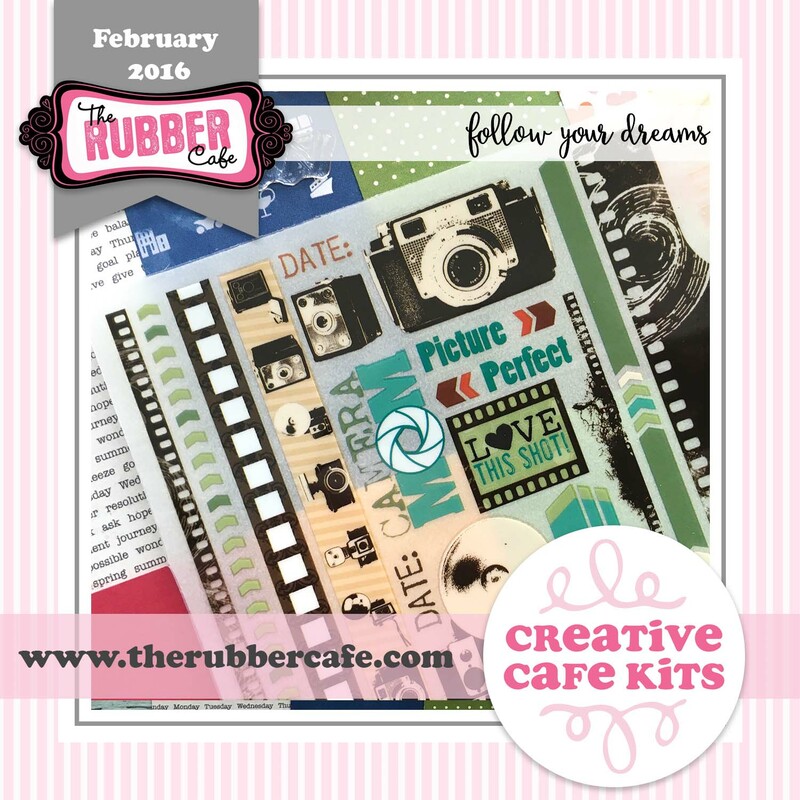 We have been sharing our February Creative Cafe Kits - Follow your Dreams, for a few weeks now. Aren't the stamps awesome? There is so much you can do with them. 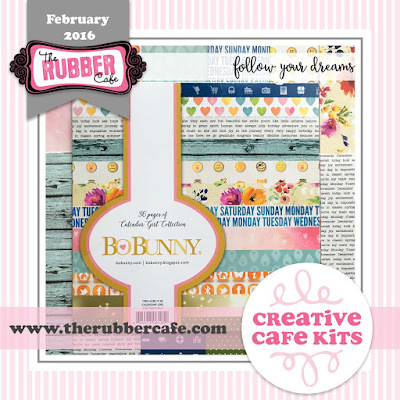 The Bo Bunny papers that are included are just bright and beautiful too. Lets take a look at how I started my card. 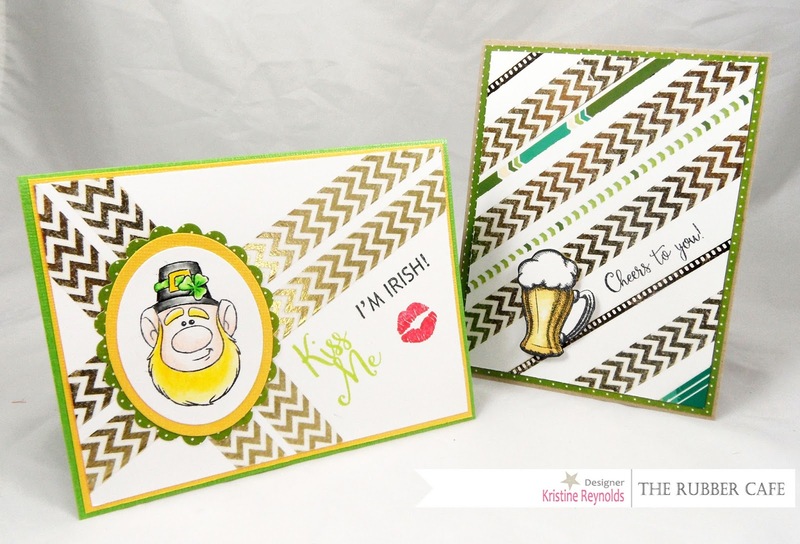 My card base is a little large than I normally make them. I cut the green cardstock on the long at 6 inches. Leaving the width 4 1/4. Next, I layered the floral paper slightly smaller on top. Added the rub-on to the left and the remaining goes on the green banner. I then cut a 3x3 pink heart and a 3 x 1 1/2 pink heart, backed with foam and applied as shown. I stamped the banner stamp across the top of the pink as you see in the picture. I cut and layered the banners on the top left, backing the green with foam and tied ribbon around as you see. 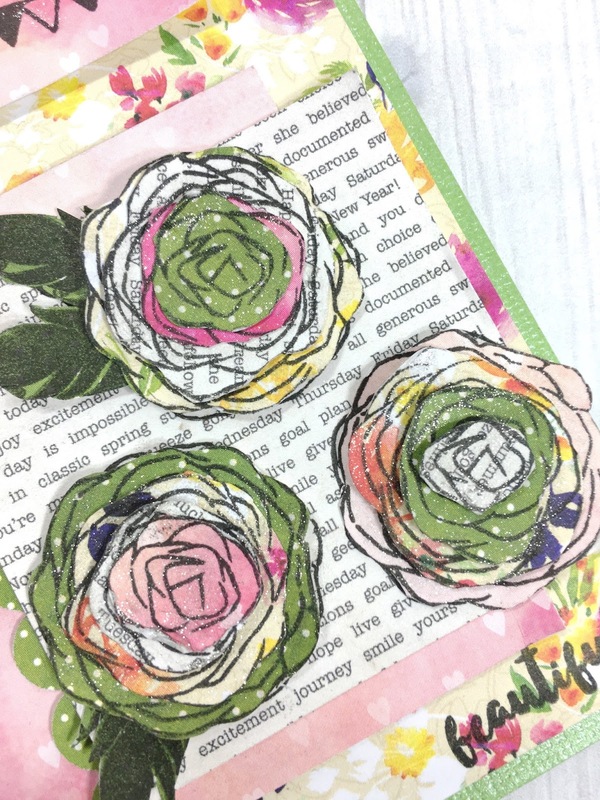 I stamped the floral stamp on several papers. Then randomly cut them from different papers. I attempted to follow the lines on the inner part of the flower to get smaller flowers. Some backed with foam and others applied flat. None of the flowers were the exact same when I was done. 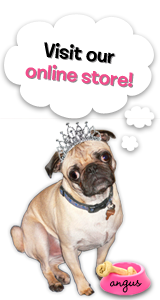 You can see from the photo below. Also, you can see that I changed one of the banner papers before I was done! Can you see in this photo that I brushed the flowers with Wink of Stella? It really does make the papers glittery and beautiful. I also used the feathers from the Birds of a Feather Set, included in your kit to get the leaves for the flowers. Lets take another look at the completed card. See you again really soon. Hi!! 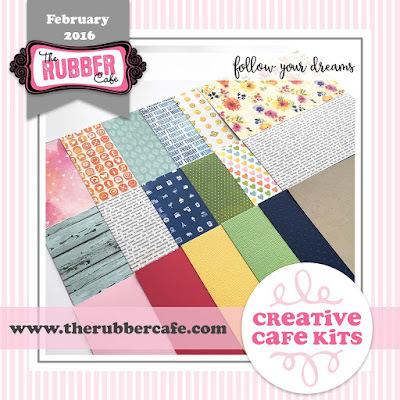 I'm Jessica Griffin, The Rubber Cafe's guest designer for the month of February! 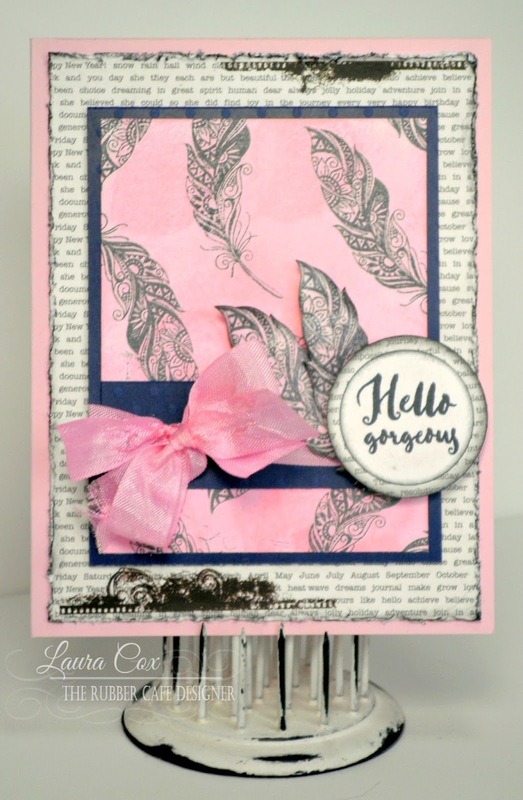 I'm so excited to be here today, sharing with you this card created using the awesome new February Creative Cafe KOTM, Birds of a Feather! When creating a card that's clean and simple, I really like to add a border to the top layer. Sometimes I'll add stitching, but most of the time I use my Multiliner from Copic to scribble a few lines. Woohoo!!!! The new kits are here! 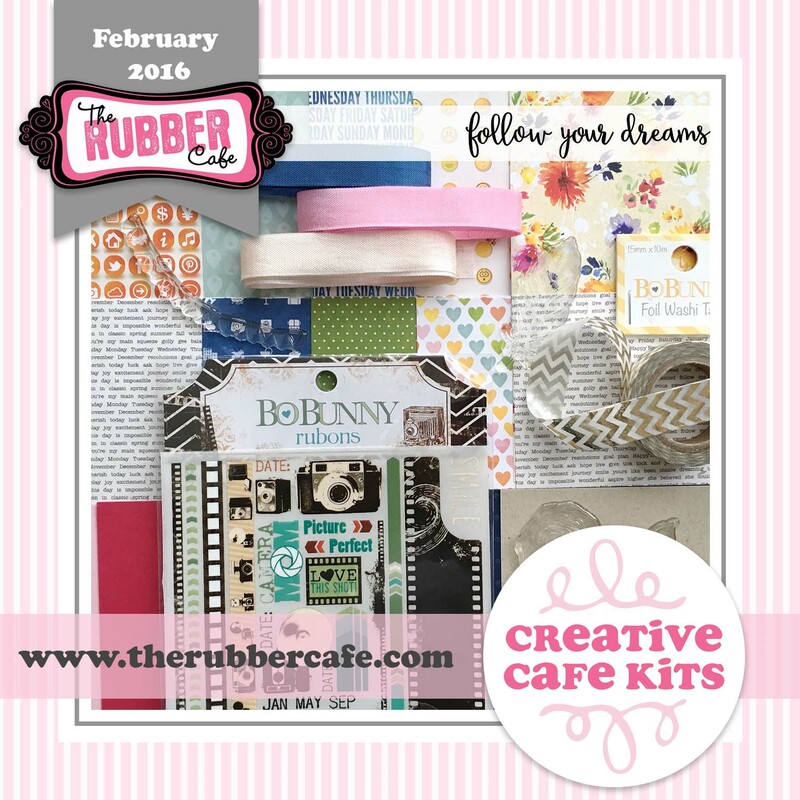 What a fun, on trend kit this month! 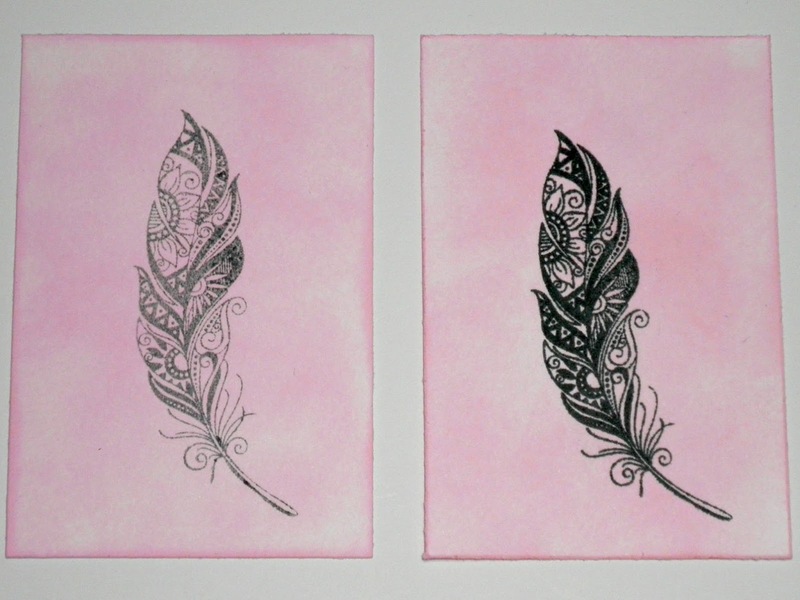 First Layer: 5&1/2" by 4&1/4" pink cardstock base. Next Layer: 5&1/4" by 4" piece of newsprint patterned paper. Rough up the edges using a scissors or distress tool, then ink using a bit of black ink (I used Black Soot Distress Ink). Cut the black swirl rub on into 2 pieces, and rub on to top right and bottom left corners. Glue to base using Scrap Happy Glue. 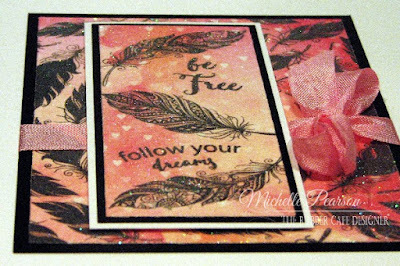 Next take a 3" by 4" piece of white cardstock, and sponge it all over using Spun Silk Distress Ink. Then stamp randomly with feather stamp using Memento Black Tuxedo Ink. The feather piece is matted to a 3&1/4" by 4&1/4" piece of dark blue swiss dot cardstock, then foam taped to the center of the card. 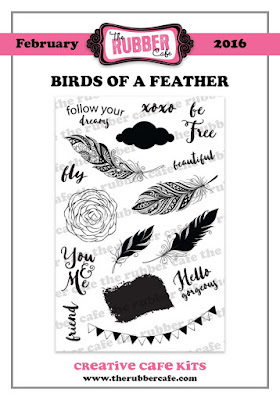 Then stamp 2 feathers onto white cardstock, and fussy cut them out. Brush with a little Spun Silk ink, then apply a very thin layer of Glossy Accents. 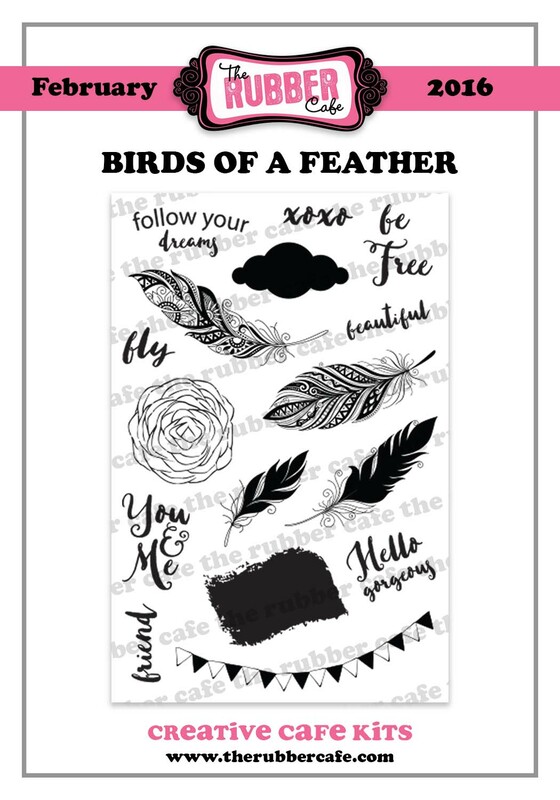 (This step isn't necessary, but I thought it gave the feathers a little "pop" and made them different from the background). Punch out a 1&1/4" white cardstock circle, stamp sentiment, and brush with a bit of Spun Silk ink and then the edges with some Black Soot ink. 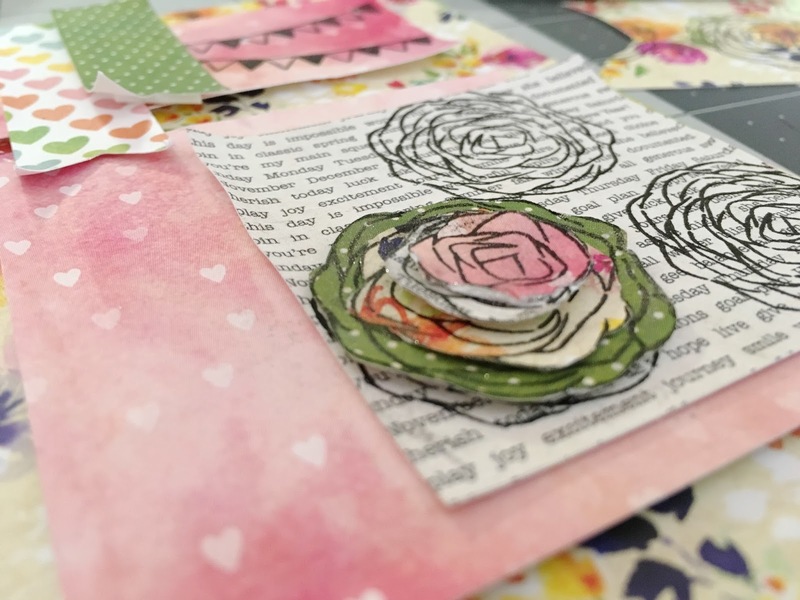 Punch a 1&1/2" circle of newsprint paper and use as a mat for the sentiment piece. Cut a 1" by 3" strip of dark blue swiss dot cardstock, and tie with pink seam binding ribbon. 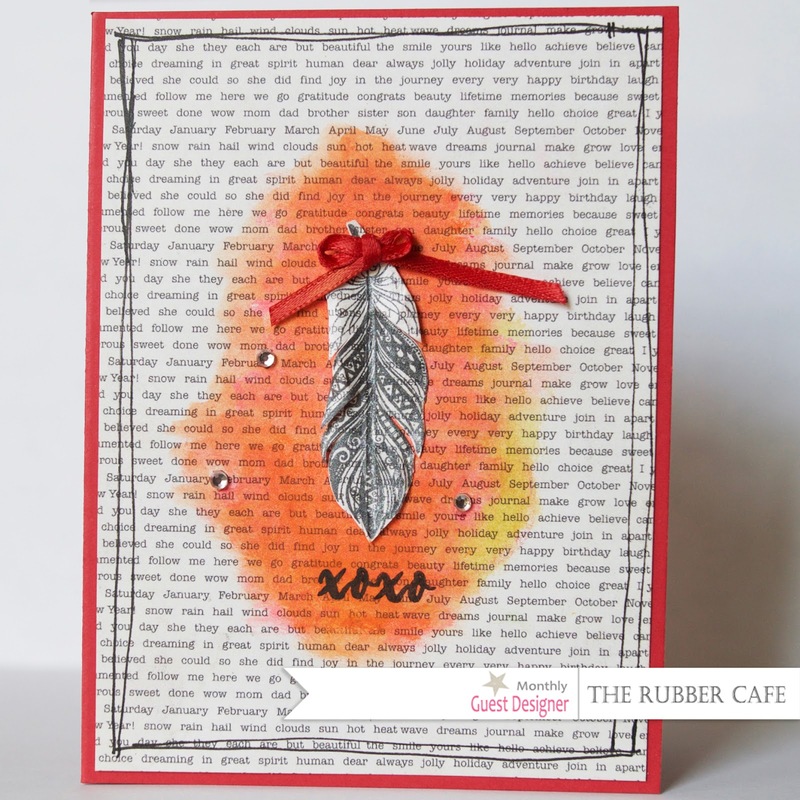 Glue to center panel of card. Foam tape sentiment and fussy cut feathers to the right side on the dark blue strip. Thanks for stoppin' by today! 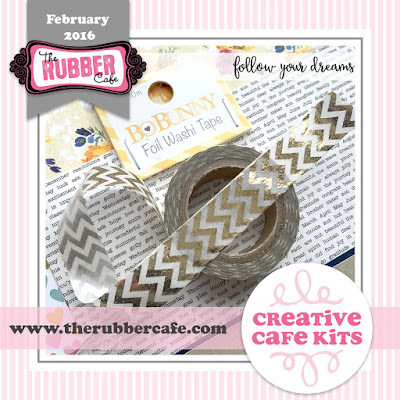 Wait until you see what the team has for you this month! 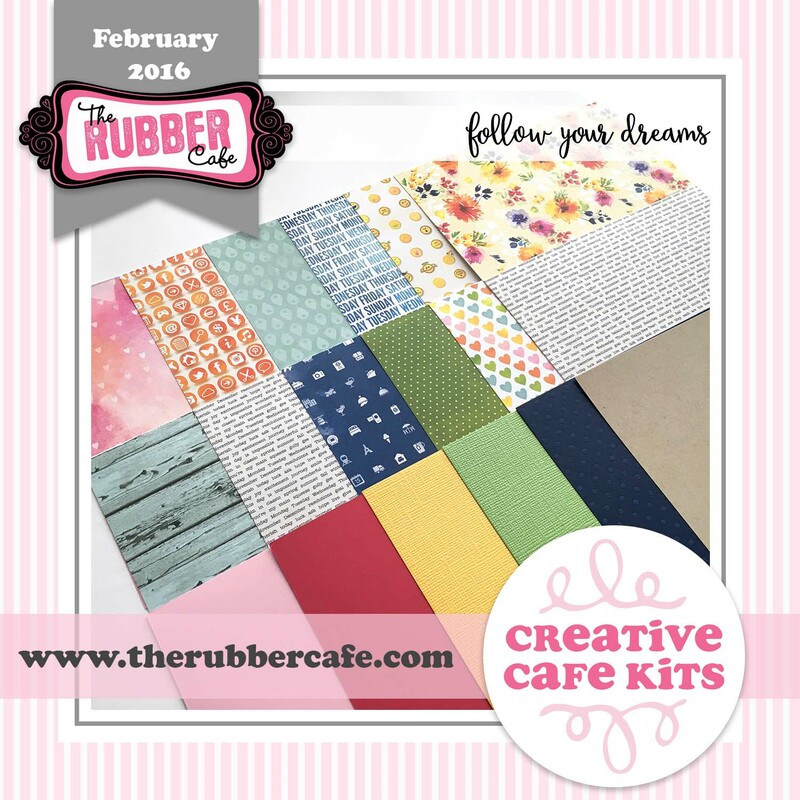 I had much fun playing with the The Rubber Cafe Creative Cafe Kit called Follow Your Dreams! 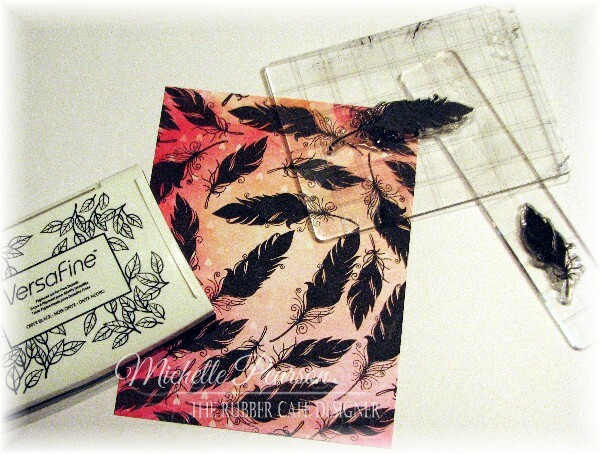 I used the Birds of a Feather set again...this time turning the feathers into leaves by stamping them on the green cardstock included in the kit with Stazon black ink! Cut off the "stem" of the feather and you have yourself a dandy leaf! 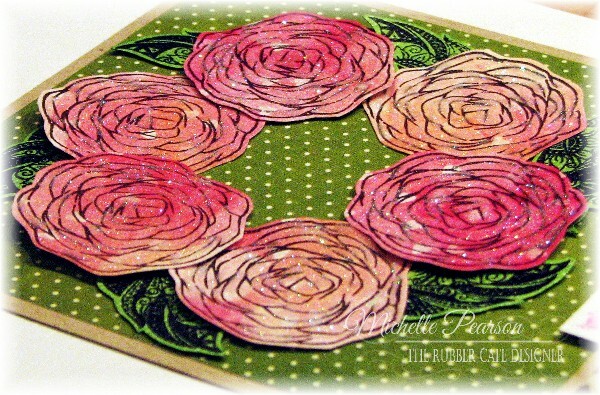 The roses I stamped onto the pink designer paper included in the Bo Bunny paper pad that is in the kit. I fussy cut the roses and then applied Scrap Happy Sheer Glue to the roses and then You're So Fine Diamond Clear Cool Highlight Glitter to them. As you can see here, I applied foam tape to every other rose to give my wreath dimension. I left the design of this card simple so that the wreath could pop. I layered some of the Bo Bunny Gold Foil Chevron Washi tape to a 4 1/4 x 3/4 inch strip of the kraft cardstock for a faux ribbon element. The sentiment is stamped on a 1 5/8 x 1 1/8 piece of white cardstock. The shadow stamp is stamped off once so the color is a bit lighter. 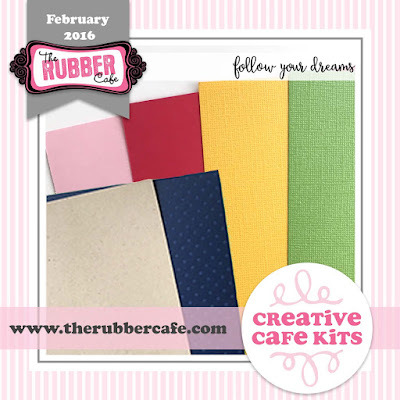 The base layer is a kraft 4 1/4 x 5 1/2 inches , the green designer paper is 4 x 5 1/4 inches. I arranged the wreath and sentiments as shown. 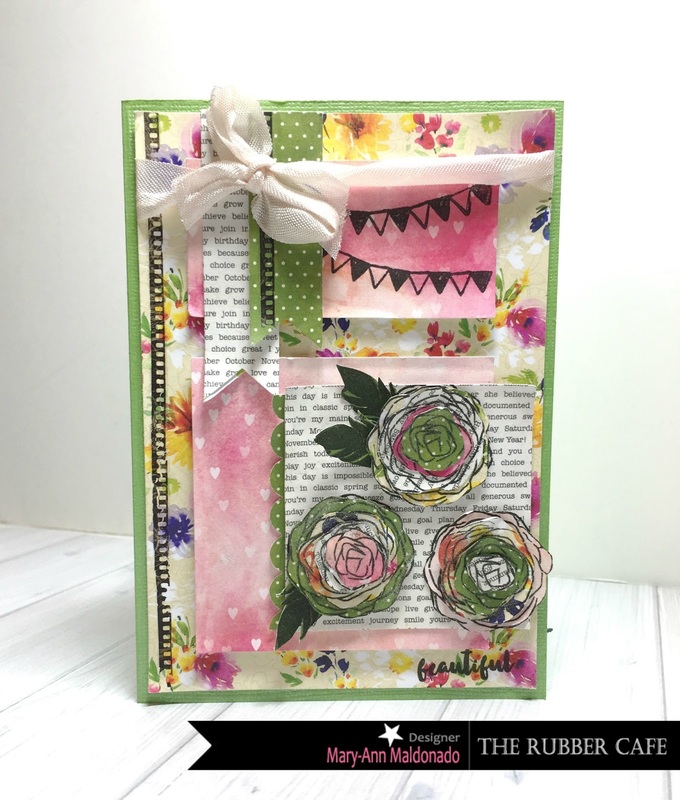 The completed card panel is attached to a folded white A2 card.